English learners are the fastest-growing student population. By 2025, one in four K-12 students will be an English learner. 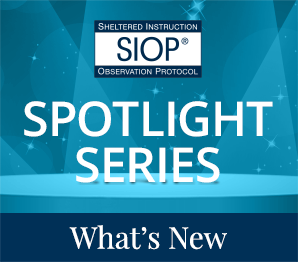 Meet their needs with the Sheltered Instruction Observation Protocol, or SIOP® Model. SIOP® is the only empirically validated model of sheltered instruction. It includes 8 major components and 30 features for teaching grade-level content while developing students’ English language skills. Developed by the author team of Dr. Jana Echevarría, Dr. MaryEllen Vogt, and Dr. Deborah Short, the SIOP® Model helps teachers develop students’ academic language skills. What characterizes a SIOP classroom is the systematic, consistent, and concurrent focus on teaching both content concepts and academic language - at the same time. Help educators work effectively with all students. Get Ideas to use in you classroom.